A Very Quahog Holo-ween Wave 2 is LIVE!! I’ll bring the Chianti, if you bring the Fava Beans, and as for the rest of our shopping list, I think our Hannibal will take care of it as we are about to blindly wander into the horror that is A Very Quahog Holo-ween! You can still work on Wave 1 Achievement tasks, collect on these as Livers can still be used to trade for Brains. Don’t fret that Bruce and Herbert have different task times for Kitchen Knives as they drop different quantities, Herbert’s longer 6 hr task drops 3 Kithen Knives, Bruce shorter task drops 2 Kitchen Knives, so this is deliberate not a glitch. There is no timer on any characters this Wave, the only timer is for 15 Bonus clams IF you can unlock Bloody Mary Bonnie within 4 days, but if you don’t manage it all you lose is chance 15 clams, you will still be able unlock the costume after 4 days. Danny Trejo: Main Prize in the Arm Up Mystery Box, costs 135 Clams per try, has 8hr task that always drops 1x Machete. Teen Wolf: New character, you’ll be directed to place him for unlocking at Pt 1 of the main Questline Dawn of the Dread. Bloody Mary Bonnie: New character costume, you’ll trigger the Side Questline to starting creating her at Al’s at Pt 2 of the main Questline Dawn Of The Dread. Task to drop Kitchen Knives and can clear Military Zombies. Brains (Always) – Main currency of the event: Get from trading Livers and/or Hands at the Quarantine Tent. Here is where you will exchange one group of Materials for another. For Wave 2, you will be exchanging Hands & Livers for Brains. Here are some of the exchanges I saw. You will trigger them and learn about them once you reach Dawn Of The Dread Part 2. You will find them wandering your sidewalks and you will need to use a combination of a Character and an item tasks to clear them. Yep TinyCo hacked added a new little element to the standard clearing tasks. But the good news is although you now need a combination the task is instant. Tap on a CDC Zombie wandering around to bring up the Payout and Character & item used info, and tap on SELECT to choose the Character. Please note you must pull Buffalo Bill or Lois from Tan Lines or the Inventory to select him successfully, if you don’t and the task pulls them from Tan Lines you will lose 1 Machete as the task will complete but with no rewards. And of course you need an item, in the case of the CDC Zombies this is 1x Machete. So basically you’ll need Lois or Buffalo Bil and 1x Machete to get clearing Zombie Boars now. You will also trigger them and learn about them once you reach Day Of a The Dread Part 2. You will find them wandering your sidewalks and you will need to use a combination of a Character and an item tasks to clear them. Yep TinyCo hacked added a new little element to the standard clearing tasks. But the good news is although you now need a combination the task is instant. Tap on one wandering around to bring up the Payout and Character & item used info, and tap on SELECT to choose the Character. Please note you must pull Chris from Tan Lines or the Inventory to select him. And of course you need an item, in the case of Military Zombies this is 1x Machete. So basically you’ll need Bloody Mary Bonnie and 1x Machete to get clearing Military Zombies. So it’s going take time to get to this. Think of this as a “CHECK LIST” of items you will unlock, tasks you will perform, or things you will need to do to help earn Livers and all sorts of other items for the Event. There’s also a Clam reward achievement linked to unlocking Bloody Mary Bonnie within 4 days. You can get to the current Achievements Check List Screen by tapping on the Icon in the lower right corner of the game screen. And don’t forget you can still work on Wave 1 Achievement Tasks, just click on the back Arrow in the Wave 2 Achievement page. Once you complete an Achievement, just tap on “CLAIM” button next to it to gain your reward. WEEKLY PRIZE: If you complete all the Achievement Tasks, you can also unlock a Weekly Prize. This weeks prize is the Zombie Chris character costume. There you have the overall basics to get you started through the 2nd Wave of the Event. Where are you so far? Anything particular you like the most? Suggestions or tips to fellow players? Let us know. 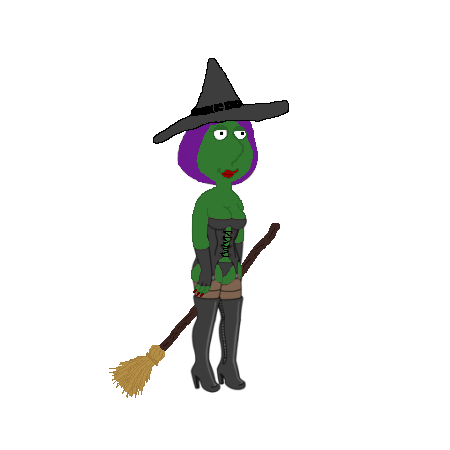 This entry was posted in Game Play, Special Event, Updates and tagged A Very Griffin Holo-ween, Bloody Mary Bonnie, Brain, Danny Trejo, Family Guy Addicts The Quest For Stuff, Family Guy Game, Family Guy Tips and Tricks, Halloween Event, Hands, Liver, Teen Wolf, Wave 2, Zombie Chris. Bookmark the permalink. Something seems weird to me so I just thought I’d ask if it was the same for everyone else. Herbert and Bruce’s tasks to collect kitchen knives aren’t the same length of time. I don’t remember it being like that before in any event. Is it like that for everyone else? I can confirm the Chop Shop is 11 brains. And are we sure the devil is 20? New object in hospital that has a timer. After geting Satan the deaths dog appeared. 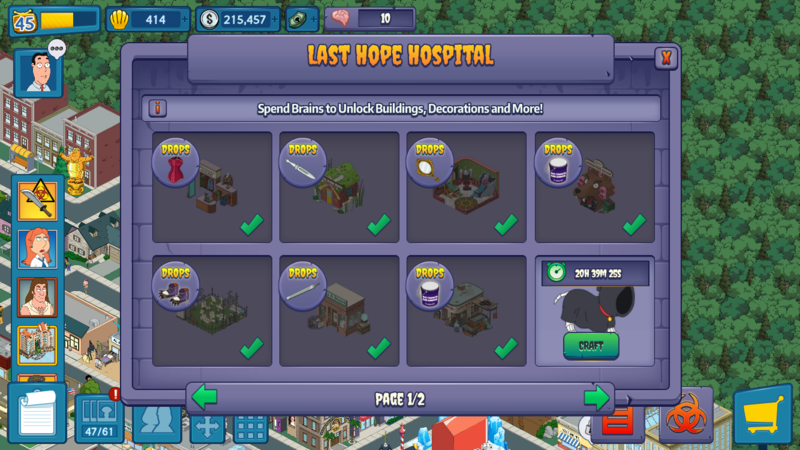 For those that have items they did not get in past Events, TinyCo is dropping them sporadically into the Hospital. They will vary by player and will all be timed. Dog is 20 brains too? Anyone up to Dawn of the Dread part 8 yet? Just wondering what is next. The weekly questline is designed in such a way it discourages one from getting teen wolf. Requires killing way too many week one baddies instead of being able to craft knives and use Bloody Mary Bonnie to take out Zombies for silver bullets. I have only tried for the mystery boxes a couple of times, never with any luck. At this point, I don’t normally even pay much attention to them. I have to say though, I couldn’t even consider this one due to it being a non tattooed Danny Trejo. Anybody get to the pet store and the chop shop to know how many brains are needed yet? Can’t find this answered elsewhere so hope it hasn’t already been asked — is Hook Hand Albert a character? A decoration? A character who isn’t really a character but just walks around? If he’s an actual character then I’m down with buying that clam package but if he doesn’t do anything then I’ll pass. Does he help with anything? He was a very hard-to-earn character from the 2015 Halloween event “Death at the Drive-In.” Would not expect him to be useful in this event. Help! My entire game reset for some reason and it won’t even give me a way to contact TinyCo for support! 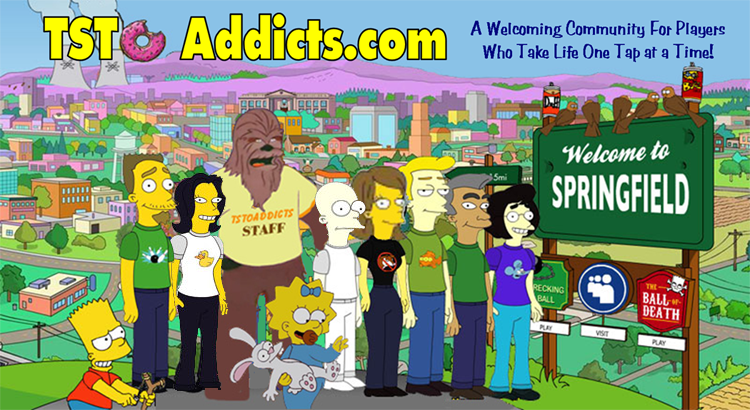 Did you have your game linked to an account? If so play through the tutorial and then load your saved game. Thanks — TinyCo fixed the issue for me. Is Hook Hand Albert voiced? I’d take a shot at the mystery box if I didn’t think there was a 99% chance of getting gas cans or livers. If they took those out, I’d definitely try it. Yeah I agree, I did a test run and got lucky as I got Danny on 2nd try but i don’t expect to get that lucky ever again. Especially when it’s Stewie in the box, I never get his costumes. A 24 hour timer for 20 brains when they can only be crafted in 3 or 5 brain increments? That’s kind of ridiculous. Especially when we have 8 things to spend brains on instead of 6 this week. Yikes…when is that triggered? When you place the Chop Shop, or when you go back after placing the Chop Shop? I already have Satan and my final room in the hospital looks empty. Not triggered last Achievement room yet though. As soon as I see materials (livers, knives etc) in a mystery box I know it’s a terrible deal and don’t even bother. I hate those mystery boxes with a character, a costume, and a bunch of event currency, but, you know, I bought all seven characters out of the all-character high school box and was happy that I did. And I’m probably not the only one. Surely they could do a few more of those if they want us to spend lots of clams.